Travis grew up surfing and skiing on the coast and in the mountains of northern California and in 2013 moved to British Columbia to pursue grad school at UBC in Clean Energy Engineering. He spends his free time enjoying adventures in the outdoors, whether in the ocean or up a mountain, the connection to natural environment is where he’s most at peace. He splits time between Fernie and Tofino to spend time adventuring with the people that matter most to him. Aside from his work as an energy consultant, he volunteers with Surfrider Foundation to promote healthy oceans and clean beaches. He brings technical knowledge to quantify the environmental benefits that are realized from the activities and campaigns Surfrider organizes to protect our oceans and beaches. He hopes to bring this experience and knowledge to the Elk Valley and find ways to connect with the people and community who can help grow environmental stewardship through the Kootenays. At the end we will connect it all back to the a local Climate Action Program and focus on waste reduction here in Fernie. 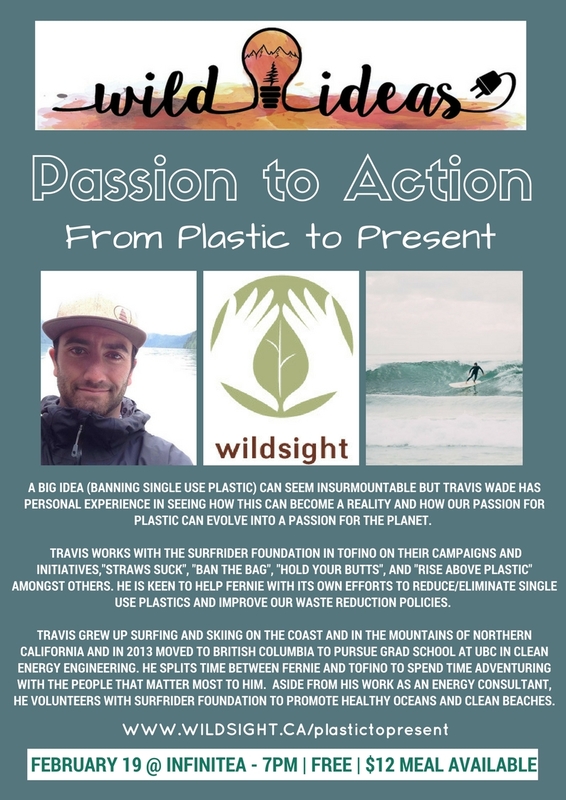 Let’s turn a passion for plastic into a passion for action!